Bad Girls – The Musical first appeared in the West End in 2007 in the wake of the hugely popular television series of the same name. 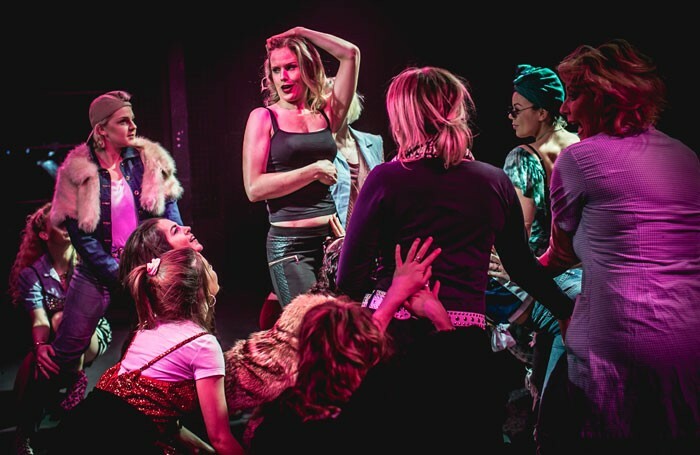 Lacking the sophistication of Chicago or the parody of Prisoner Cell-Block H – The Musical, Bad Girls touches on similar themes, complemented by a variable score from Kath Gotts. Familiar characters may have been tweaked to suit the ensemble, but amid such bawdy melodrama it barely matters. First-time director Will Keith delivers an efficient, traverse production, brought to life by Jo McShane’s snappy choreography. Sinead Long is appropriately aggressive as top-dog Shell Dockley, lording it over a wing of equally dodgy lags, each with their own story to tell. Christine Holman injects some fur-clad glamour into the proceedings as mobster-wife Yvonne Atkins, and in a predominantly female cast Gareth Davies as Jim Fenner stands out as an effective comedy villain. Tori Hargreaves and Ceili O’Connor negotiate the central love story with sensitivity, establishing the emotional heart of the show and providing its most endearing duet, Every Night. A chorus of pencil-skirted wardens, catfights on G-Wing and a cougar mentality help flesh out an admittedly thin musical, but Keith’s production slips neatly into the category of guilty pleasure.